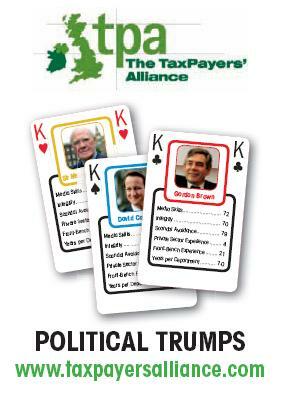 The TaxPayers' Alliance has produced the must-have accessory for all rainy days and long trips: Political Trumps! The cards include today's major political figures with Labour, Conservative, Lib Dem and minor parties all represented. Every politician has been rated on their media skills, scandal avoidance and integrity by a panel of political journalists, bloggers and think tankers. There are fascinating details of some of our most famous contemporary political figures on each of the 52 cards, plus the obligatory two jokers. The TPA cards are dual purpose, carrying both Political Trumps data and conventional playing card suits. To play Political Trumps just match up politicians against each other on their different rankings and see how they compare. Each player chooses a category and squares off with their opponent – if their card has a superior ranking, the player claims that card. The winner is the player who collects all the cards in play. Alternatively, just use the cards as a conventional novelty deck when you next play bridge or poker. (Cost including P&P is £3.99 per pack). Alternatively, send a cheque for £3.99 made payable to "The TaxPayers' Alliance" to 43, Old Queen Street, Westminster, LONDON, SW1H 9JA. Tony Blair (Ace of Clubs), scores the highest on media skills, and Ed Balls the lowest. On integrity, the Labour MP Frank Field tops the rankings, and John Prescott has the lowest score. On scandal avoidance, Ming Campbell is judged the safest pair of hands, and John Prescott (again!) scores the lowest. Sir Digby Jones beats every other politician, with 30 years of private sector experience, compared to more than a dozen politicians who have 0 years of experience outside of politics. The leader of the Democratic Unionist Party, the Rev. Ian Paisley, scores the highest on front-bench experience, leading his party for 38 years. The Conservative Shadow Education Secretary – Michael Gove – comes top, with 248 points, followed closely by Nick Clegg, Frank Field and Alex Salmond (all 245 pts). Gove scores highly on media skills (82 pts), integrity (78 pts) and scandal avoidance (88 pts). At number 15 in the rankings with 221 points, the Prime Minister, Gordon Brown, beats the Liberal Democrat leader Ming Campbell (213 pts) and the Opposition leader David Cameron (209 pts). At the bottom of the league, with a mere 117 points out of 300 is John Prescott, followed by David Blunkett (141 pts). As well as being a bit of fun, Political Trumps also has a serious message. Public services are failing because politicians lack the management experience and subject knowledge that is needed to run large, complex organisations. Services will only become more effective and efficient when politicians stick to setting high-level policy and remove themselves from management.